Knowing how directionally challenged I am, I have come to expect that it is likely I might get lost when trying to find a new place, even with my trusty Garmin…With each new outing. I rely on knowing that my tenacity will get me where I want to go, even if there are a few wrong turns or detours along the way. The answers we come up with are likely to depend on our sense of faith, tenacity and resilience. This inner knowing and remembering how we have managed to regain our sense of direction in the past is something very solid to hang onto when we’ve lost our way again. But what happens when self doubt creeps in and takes over? All of our self talk can feel like a seemingly insurmountable roadblock to coming through a challenging life change and moving forward in the process. 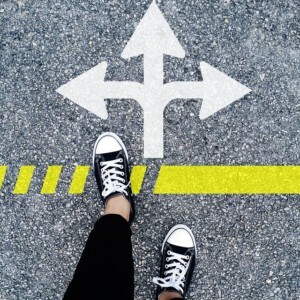 My own acceptance of the likely possibilities of getting lost when trying to find a new place holds some helpful hints on how we can find our way through both expected or unexpected life changes and transitions that we all face at different points in our lives. 1. Expectations – When we hold onto expectations that our life journeys are supposed to be smooth, easy and fair, we’ve already taken that wrong turn. What we are left with is anger and resentment that whatever unfair life circumstance has come our way “shouldn’t” be happening. 2. Victimizing – When our expectations aren’t met we are tempted to travel to that dark dead end of feeling like a victim. This robs us of a will, resilience and perseverance to gather our supports around us to find the way out of the stuckness of a bitter divorce or fears of retirement and aging. 3. Fear – In feeling betrayed by unmet expectations and becoming a victim we get stalled in our fear. We have trouble seeing choices and ways to “recalculate” to find our way. 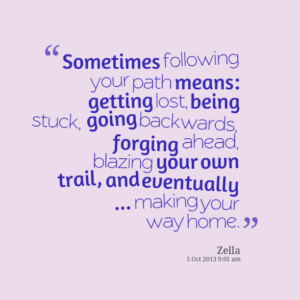 What I’ve come to learn about my directionally challenged self and what I need to keep reminding myself, is that I do have the tools to get myself back on the road and pointed in the right direction! And…you do too! 1. Stop and take stock – Create some space to take a deep breath and allow yourself to clear your head and heart of stress and anxiety. This is a valuable beginning. 2. Use Your Tools and Supports – Look at the map, ask for help. Dig for faith in yourself to find your way. What has helped you in the past? Be patient and caring with yourself. Humor helps too! 3. Awareness – Be open to possibllies. Divorce, retirement, aging or other life changes that have occurred hold the potential of new directions, meaning and growth, sometimes when you least expect it. We all get lost at some point or another in life, but we don’t need to stay lost. Just as I know I always have my Garmin, maps and phone when I venture to someplace new, I also bring my patience, sense of humor and forgiveness. It is like that in our life transitions too. It makes the challenges of change just a little less daunting having faith in being able to turn yourself around and point yourself in the direction you want to go!